I think when we designed the Indulgence collection everyone in our office gained a few pounds. Every time we glanced at the designs we felt the need to have a treat. This collection contains 20 jumbo blocks full of delicious desserts! 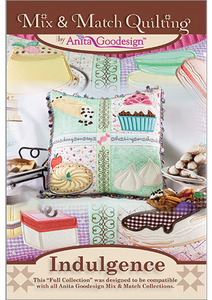 Each of the Indulgence designs uses a unique process called puffy appliqué. This technique uses batting underneath one of the appliqués in the design that creates a raised effect. The designs are digitized a unique way with spot tack stitches in addition to the regular tack-down stitch so that the fabric and batting will lay flat and not pucker or pinch. The collection also includes 8 different border blocks to create a beautiful pillow, quilt or wall hanging.